An engagement ring can often be a woman’s most treasured and meaningful item of jewellery, symbolising a commitment to one another and serving as a constant reminder of the love that a couple shares. It is also almost always one of the most valuable item’s of jewellery that a woman will own – traditionally costing two months’ salary. It is not unsurprising then that many will choose to wear their bespoke diamond engagement ring every day, but this, predictably, means that your ring will require a clean every so often to maintain its sparkle. 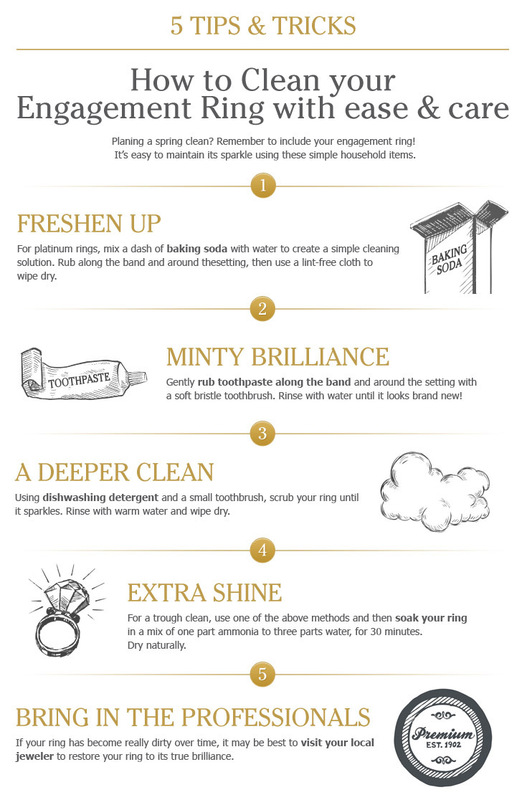 Below you will find an easy guide to keep your ring looking brilliantly clean and beautiful – better yet, you won’t have to waste money on costly diamond cleaning solutions as you will find all the ideal ingredients in your home! Depending on how much dirt your bespoke diamond engagement ring has accumulated over time, we have compiled several effective ways to ensure your diamond ring keeps its reflective qualities below. Baking soda mix – Freshen up platinum rings with an age-old simple cleaning solution you can mix up yourself. The ingredients? A small amount of baking soda and water. All that’s required is a gentle rub of this cleaning solution around the setting and along the platinum band, before using a lint-free cloth to wipe off any remaining residue. A brilliant smile – Watch as your engagement ring returns to its former sparkling glory by using a little toothpaste and a brush with extra-soft bristles to lightly brush along the band and across the setting. To finish, simply rinse with water. Not just gleaming dishes - Achieve a deeper clean by scrubbing your ring using a toothbrush and a small amount of dishwashing detergent. Use lukewarm water to rinse and wipe dry. Not impressed? If you have tried one of the above cleaning methods but were hoping for better results, you can achieve extra shine by soaking your ring for half an hour in a mix of ammonia and water. Use a quarter ammonia solution and three-quarters water and leave your bespoke diamond engagement ring to soak. Afterward thirty minutes, remove your ring from the solution and allow it to dry naturally. If your ring is extremely dirty, you may find a visit to your local jeweler to be more helpful. Have a question or looking for a ring bespoke ring? Contact us today on 0800 046 1340 if you’re in the UK or 1866 805 5010 if you’re in the US. Alternatively, you can email us at enquiries@lavivion.com. Subscribe to our RSS Feed, follow us on Twitter and Facebook, or simply recommend us to friends and colleagues!